What are the benefits of learning how to play an instrument? Playing an instrument can actually improve a person's overall well-being! Playing just five minutes a day can be beneficial to emotional and physical health. For kids, playing an instrument enhances youth brain development, which can lead to higher confidence, improved academic achievement, and better social skills! Playing an instrument improves hand-eye coordination. Playing an instrument increases creativity. It encourages children and adults to express themselves. Playing an instrument builds confidence. Learning how to play an instrument can lead to increased patience. Playing an instrument can boost the immune system. Are you ready to learn how to play guitar, or do you want to give your child the gift and the benefits of music education? 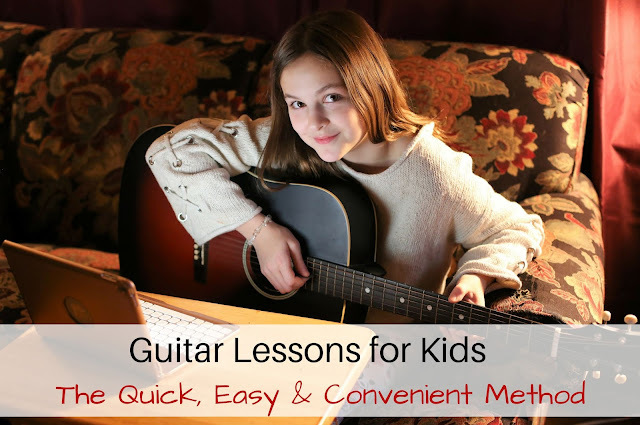 There's a quick, easy, and convenient alternative to traditional music lessons! Why should you choose Fender Play? Fender Play is great choice for learning how to play guitar, ukulele or bass, because the app is really easy to use, and you can learn at your own pace! The best part? It's actually less expensive than one traditional music lesson, and you can learn in the comfort of your own home...or really, anywhere! Fender is the most trusted name in guitar, so it makes sense that they offer a quality learning app. You can actually learn how to play your first song in just 22 minutes thanks to the short lessons which are designed by music education professionals, and professionally filmed! They use a micro-learning approach so you can learn easily and quickly. Fender Play offers a FREE 14 day trial so you can try it out before you commit. If you like it, and choose to continue, you will only spend as much on a year of Fender Play as you would for one in-person lesson! You can even choose the style you want (Rock, Pop, Blues, Country, or Folk), and learn how to play the well-known songs that you love! With Fender Play, you can learn at your own pace. They track your progress, and have guided paths so you can learn WHEN and HOW you want! When you log back on, you can pick up right where you left off! I downloaded Fender Play, and chose the 14-day free trial, so Lexie could start her guitar lessons. They offer two convenient payment options after the free trial is over: a monthly plan or a yearly plan (best value). I love how I can log in on any device, and access the guitar lessons! When we were setting up the account, Lexie got to choose which style she wanted to learn. She, obviously, chose pop! 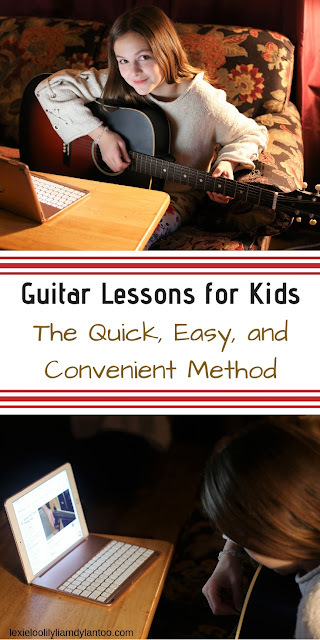 She grabbed the guitar, got set up to learn, and started with the basics: Get To Know Your Guitar, Get Set Up, Sound Advice 101, The Importance of Strumming Right, Tune Up, and Finger Placement Get It Right. It was easy for her to follow along, and in just a few short minutes, she was on her way to learning how to play guitar. Although Lexie's lessons just began, I have no doubt she will playing a tune in no time! Lily watched Lexie's instructor-guided lessons on the app, and showed interest in trying to play. When Lexie was finished for the day, Lily sat down and watched several of the videos, and started to play by herself. After about 20 minutes, she ran out, and plucked each string while saying which note it was, thanks to the clever saying they are taught! Not to be outdone, Liam scooped up the guitar and tried it himself. Although he absolutely loves music, it's going to be a little while before his tiny hands are big enough to hold that guitar!!! As you can see, Fender Play is fun for the entire family! I can't wait to see the progress my girls make over the next few weeks. And maybe, just maybe, Dylan and I will give it a try, too. After all, we do have a few unused guitars just hanging around in our house! Try Fender Play for yourself with a free 14 day trial! Right now, there's even a special offer...with the annual plan, you'll also get 10% off Fender gear for the entire year in the US and the UK! Give the wonderful gift of music TODAY! It's so cool that they are learning to play guitar!